Getting bored of Reading or planning a trip down for a few days, this A-Z list of things to do should help you out. This is probably not going to be the most informative piece of literature that you will read , but hopefully it will give you a little knowledge of where to go in Reading if you are wanting a fun day out, food or even a night out! An indoor trampoline park, a perfect place to let off some stem. They even have student nights where it’s £8 for two hours! It’s also much more fun than going to the gym to exercise. A little drive away but a great day out for families and even us teenagers who love animals. It is an animal park located in Bucklebury and consists of mostly Animals, a play area, a cafe and a farm shop. I honestly had such a lovely day here! This place is amazing. If you haven’t been yet, you must! Its very similar to places like Wagamama’s but personally I think it’s better. They have amazing starters like squid, dumplings and spring rolls and then for main, choose from noodle dishes or even a katsu curry. They have a great lunchtime deal with a variety of bento boxes and a drink for only £9.50. Oh I nearly forgot, their cocktail menu is just as good as their food! The student deals at Dominos are far too tempting when you are sat writing essays all day, especially as they deliver till 5am. A real-life room escape game based in Reading. After entering a room with your team, the door is locks behind you and you have 60 minutes to escape! A beautiful park situated in Reading, a wonderful place for a summers walk or if you are feeling energetic, a run. Spend the day on the grass watching the day go by, explore Reading Abbey or have a picnic. Situated in Bracknell, you fly down zip-wires, leap off the Tarzan Swing and tackle obstacles whilst enjoying some beautiful scenery. It’s hard to believe that this is situated on Reading campus. It’s the perfect place for a picnic or even for a quiet revision spot in the sun. Who doesn’t love a trip to Ikea? One has opened in Reading! Walking around pretending that the kitchen and living rooms are ones in your very own house. Plus, you can’t say no to the meatballs. A prime place for a sophisticated night of prosecco, cocktails and good food. It is only quick train ride away. It’s easy to get to and not too pricey on the train either. Go for a day trip, visit galleries, spend the day in Hyde Park or even be a tourist for the day and go on the London Eye. Cheap drinks and great music. It’s a place where you spend most your night on the staircase wondering if you are in the queue for the smoking area or the toilets. The place for some well deserved retail therapy. From H&M, Topshop, to Hollister, Victoria Secret and Apple, It has something for everyone. You will spend half your time in the smoking area and the rest wandering the basement wondering where the dance floor actually starts and why the seating areas are in caged prison cells. A room full of sweaty freshers, split drinks and a steep staircase. You will usually find yourselves here every Monday, trying to drink away all your uni deadlines. 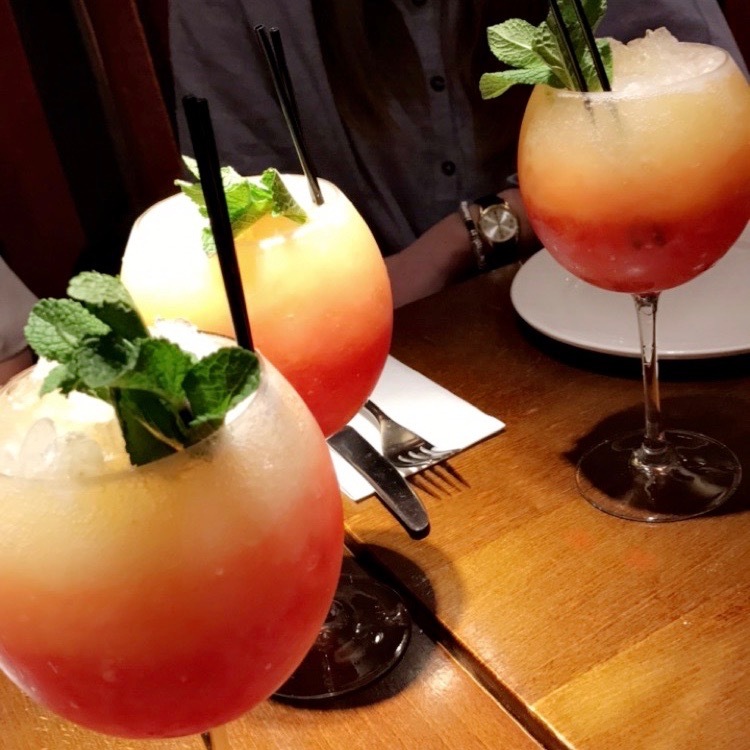 Revs is where people go to try and have a classy, sophisticated night with a few cocktails or a bottle of prosecco. But all that goes out the window when they bring out trays of flavoured vodka shots. Coffee, chocolate, peach and even chilli flavoured. Not too far from the centre of Reading is a lovely little place called Wargrave, home to the cutest gastro pub, St George and Dragon. A beautiful terrace over looking the river, where you can spend the summer days with a Pimms in hand watching the canoes and boats go by. Plus why not share a baked camembert while you are there! The name of the place explains it all, full of amazing treats! From cookie dough to ice cream sundaes, waffles and milkshakes. Treatz is an amazing dessert parlour with something for everyone and its situated right in Reading town centre. Cinemas nowadays may be very over priced but who doesn’t love a good cinema trip, popcorn and a Tango ice blast. A great way to spend an evening off revision and that way you can wake up hangover free for another day of revision. If you are ramen obsessed like I am then this is the place to go, they also do amazing noodle dishes and katsu curry! This is cheating a little…. Let’s just says it could be what you will be needing after a night out in Reading! An huge array of sushi, hot and cold and not too expensive, especially if you go on a Monday for Blue Monday! It’s the best spot for a quick bite to eat or a catch up with old friends. Zero Degrees is situated just outside of the Oracle, near Purple Turtle. Its the perfect place for any occasion, whether that’s a drink on one of their two balconies or a celebratory meal and drinks. I would love to hear about any places you think should be on this list. What do you love about Reading? Leave some comments!